Osteoarthritis (OA) of the wrist, while not as common as OA in weight-bearing joints, is nevertheless not uncommonly encountered by orthopedic surgeons in day-to-day practice. Arthritis of the wrist results in both severe pain and restriction of movement. Early in the disease, patients may have well-preserved, useful range of motion but severe pain. The images below depict severe wrist arthritis. The clinical presentation of wrist arthritis can be severe deformity, especially in patients with rheumatoid arthritis. Wrist arthritis is also common in patients with rheumatoid arthritis (RA), which is a systemic autoimmune inflammatory disorder that affects the joints; in the upper limb, the wrist is most frequently affected. RA invariably results in functional difficulty over time. The image below depicts RA of the wrist. Rheumatoid arthritis of the wrist. Surgery is indicated for wrist arthritis when disabling pain emerges despite nonoperative treatment. The type of arthritis, the extent of its involvement, the functional requirement of the patient, and the realistic expectations of the proposed treatment should be considered before treatment is undertaken (see Treatment and Management). For many decades, synovectomy of the wrist alone was used in patients with inflamed joints. This procedure is usually most beneficial when considerable synovitis is present, as in RA or psoriatic arthritis rather than OA. Different techniques for wrist arthrodesis with different methods of bone grafting and fixation have been described in the literature. The AO (Arbeitsgemeinschaft für Osteosynthesefragen, or Association for the Study of Osteosynthesis) technique of compression arthrodesis of the wrist has yielded good results. Arthroplasty of the wrist has been in use for the last few decades. Initial devices were metal and plastic wrist prostheses with cement fixation that had 2 stems for distal fixation. As the wrist progressed to ulnar deviation, the procedure was changed to a single distal stem into the third metacarpal alone. Ball-and-socket design implants were associated with significant component loosening; hence, a transversely oriented, semiconstrained, ellipsoid design implant was developed. Later, semihinged implants were developed. However, the implants have not yielded the same satisfactory results seen with total hip or knee arthroplasty. Hence, wrist arthrodesis remains the criterion standard in the treatment of wrist arthritis. The wrist extends from the distal border of the pronator quadratus up to the carpometacarpal joints of the fingers. It is a complex hinge joint that involves the distal radius, distal ulna, 7 carpal bones (among which the pisiform acts mainly as a sesamoid), and the base of 5 metacarpal bones. The wrist joint can be divided into radiocarpal, midcarpal, and intercarpal joints. The movements available in the joint are dorsiflexion, palmar flexion, radial deviation, ulnar deviation, and a combination of 2 or more of these movements. The wrist functions by positioning the hand in relation to the forearm, providing a mechanical advantage, and also acts as a stabilizer for effective functioning of the hand. The motor fiber units that produce wrist motion arise proximally in the forearm, cross the wrist, and then are inserted distally to the wrist without any attachment to the carpal complex. The unique kinetics of the carpal bones depend on the intricate carpal geometry (and arrangement), ligament function, and muscle activity. Carpal bones are arranged in 2 rows. From radial to ulnar, the proximal row consists of the scaphoid, lunate, triquetrum, and pisiform, whereas the distal row has the trapezium, trapezoid, capitate, and hamate. Accessory carpal bones are present in 1.6% of the population. One of these accessory bones is the os centrale carpi, which sits between the scaphoid, capitate, and trapezoid and may be responsible for the condition "clicky wrist." The pathophysiology of wrist arthritis varies, depending on whether the cause is osteoarthritis (OA), rheumatoid arthritis (RA), gouty arthritis, or secondary arthritis. During the initial stages of OA, fibrillation and cracking of the superficial layers of the articular cartilage occur. As the degeneration progresses, deep layers become involved, finally resulting in erosions that produce bare subchondral bone. Denatured type II collagen is found in abundance in OA articular cartilage; it is characterized by a decrease in the water content and in the ratio of chondroitin-sulfate to keratan-sulfate constituents. In chronic injuries of the scapholunate ligament and in scaphoid nonunions, OA starts in the radioscaphoid joint and progresses to the capitolunate joint. The radiolunate joint remains unaffected during the early stages. RA is a progressive inflammatory disease characterized by synovitis and joint destruction. Synovial cell proliferation results in pannus formation and fibrosis, which, in turn, result in erosion of cartilage and bone. Cytokines, prostanoids, and proteolytic enzymes mediate this process. A cell-mediated immune response to an unidentified antigen seems to be the important factor in the pathogenesis of RA. Proinflammatory cytokines, such as IL-1 and tumor necrosis factor-alpha (TNF-α), are the central mediators in RA with T-cell initiation. In gouty arthritis, allantoin, the enzyme uricase that breaks down uric acid into a more soluble product, is deficient, resulting in tissue deposition of crystalline forms of uric acid. Although hyperuricemia is a risk factor for the development of gout, the exact relationship between hyperuricemia and acute gout is unclear. Acute gouty arthritis can occur in the presence of normal serum uric acid concentrations. Conversely, many patients with hyperuricemia may never develop gouty arthritis. Trauma to the carpal bones or ligaments may result in abnormal joint reaction forces with each movement of the wrist, causing misdirected forces that lead to some combination of loading forces. This process produces degeneration of the articular cartilage, resulting in radiocarpal arthritis, selective intercarpal arthritis, or pancarpal arthritis, depending on the initial injury and subsequent healing. Scaphoid fractures in particular can result in OA by 3 different mechanisms. First, if the fracture results in nonunion, abnormal movement occurs between the fragments, leading to an abnormal distribution of forces across the wrist and resulting in early degeneration of the radioscaphoid joint. Second, in malunion, the height of the scaphoid may be reduced. Furthermore, the range of motion in 1 or more planes may be restricted, resulting in increased strain and leading to OA changes over time. 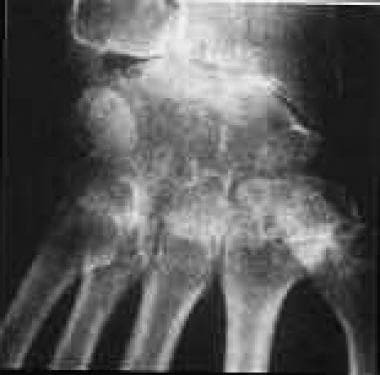 Third, scaphoid fractures resulting in avascular necrosis of the proximal pole can lead to collapse and, thus, degeneration of the radioscaphoid joint. The lunate may then become involved and, subsequently, the entire wrist. Kienböck disease results in lunatomalacia; the weakened lunate is subjected to a nutcracker effect between the prominent radius and the capitate head, causing progressive collapse. In its final stages, Kienböck disease leads to the beginning of OA in the radiolunate joint. Primary OA occurs because of the degeneration of the articular cartilage. Various reasons have been postulated for this occurrence, including the important roles played by age and genetics. 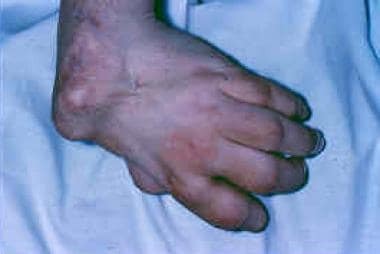 Kienböck disease (avascular necrosis of the lunate) can also result in wrist arthritis. Inflammatory arthritis of the wrist may be caused by RA, psoriasis, or crystal-induced arthritis, which includes gout and pseudogout. Secondary arthritis of the wrist joint is common because of the complex anatomy and kinematics involved. Approximately 1 person in 7 (13.6%) of the US population has wrist arthritis. Gout affects the wrist in 0.28% of the population. RA affects the wrist in 2.5 million people in the US, and the general prevalence of wrist arthritis is 75%. One wrist joint is affected in 30% of patients, but the condition then progresses to become bilateral in 95%. The distal radioulnar joint is affected in approximately 50% of patients with rheumatoid wrist arthritis. Weiss AP. Osteoarthritis of the wrist. Instr Course Lect. 2004. 53:31-40. [Medline]. Hamalainen M, Kammonen M, Lehtimaki M, et al. Epidemiology of wrist involvement in rheumatoid arthritis. J Rheumatol. 1992. 17:1-7. Clayton ML, Ferlic DC. Arthrodesis of the arthritic wrist. Clin Orthop Relat Res. 1984 Jul-Aug. 89-93. [Medline]. Watson HK, Goodman ML, Johnson TR. Limited wrist arthrodesis. Part II: Intercarpal and radiocarpal combinations. J Hand Surg Am. 1981 May. 6(3):223-33. [Medline]. Ma JD, Wei XN, Zheng DH, Mo YQ, Chen LF, Zhang X, et al. Continuously elevated serum matrix metalloproteinase-3 for 3 ~ 6 months predict one-year radiographic progression in rheumatoid arthritis: a prospective cohort study. Arthritis Res Ther. 2015 Oct 14. 17:289. [Medline]. Grodzinsky AJ, Wang Y, Kakar S, Vrahas MS, Evans CH. Intra-articular dexamethasone to inhibit the development of post-traumatic osteoarthritis. J Orthop Res. 2017 Mar. 35 (3):406-411. [Medline]. [Full Text]. Schwenzer NF, Kötter I, Henes JC, Schraml C, Fritz J, Claussen CD, et al. The role of dynamic contrast-enhanced MRI in the differential diagnosis of psoriatic and rheumatoid arthritis. AJR Am J Roentgenol. 2010 Mar. 194(3):715-20. [Medline]. Zierhut ML, Gardner JC, Spilker ME, Sharp JT, Vicini P. Kinetic modeling of contrast-enhanced MRI: an automated technique for assessing inflammation in the rheumatoid arthritis wrist. Ann Biomed Eng. 2007 May. 35(5):781-95. [Medline]. Xanthopoulos E, Hutchinson CE, Adams JE, Bruce IN, Nash AF, Holmes AP, et al. Improved wrist pannus volume measurement from contrast-enhanced MRI in rheumatoid arthritis using shuffle transform. Magn Reson Imaging. 2007 Jan. 25(1):110-6. [Medline]. Chaudhari AJ, Ferrero A, Godinez F, Yang K, Shelton DK, Hunter JC, et al. High-resolution (18)F-FDG PET/CT for assessing disease activity in rheumatoid and psoriatic arthritis: findings of a prospective pilot study. Br J Radiol. 2016 Jul. 89 (1063):20160138. [Medline]. Feydy A, Pluot E, Guerini H, Drapé JL. Role of imaging in spine, hand, and wrist osteoarthritis. Rheum Dis Clin North Am. 2009 Aug. 35(3):605-49. [Medline]. Taljanovic MS, Melville DM, Gimber LH, Scalcione LR, Miller MD, Kwoh CK, et al. High-Resolution US of Rheumatologic Diseases. Radiographics. 2015 Nov-Dec. 35 (7):2026-48. [Medline]. Ichikawa S, Kamishima T, Sutherland K, Okubo T, Katayama K. Radiographic Quantifications of Joint Space Narrowing Progression by Computer-based Approach Using Temporal Subtraction in Rheumatoid Wrist. Br J Radiol. 2015 Oct 20. 20150403. [Medline]. Baker JF, Ostergaard M, Emery P, Hsia EC, Lu J, Baker DG, et al. Early MRI measures independently predict 1-year and 2-year radiographic progression in rheumatoid arthritis: secondary analysis from a large clinical trial. Ann Rheum Dis. July 2013. [Epub ahead of print]:[Medline]. Adams BD. Surgical management of the arthritic wrist. Instr Course Lect. 2004. 53:41-5. [Medline]. Bhamra J, Bhamra K, Hindocha S, Khan W. "The Role of Wrist Fusion and Wrist Arthroplasty in Rheumatoid Arthritis". Curr Rheumatol Rev. 2015 Oct 26. [Medline]. Roll SC, Hardison ME. Effectiveness of Occupational Therapy Interventions for Adults With Musculoskeletal Conditions of the Forearm, Wrist, and Hand: A Systematic Review. Am J Occup Ther. 2017 Jan/Feb. 71 (1):7101180010p1-7101180010p12. [Medline]. [Full Text]. Willis AA, Berger RA, Cooney WP 3rd. Arthroplasty of the distal radioulnar joint using a new ulnar head endoprosthesis: preliminary report. J Hand Surg Am. 2007 Feb. 32(2):177-89. [Medline]. Sammer DM, Shin AY. Comparison of arthroscopic and open treatment of septic arthritis of the wrist. Surgical technique. J Bone Joint Surg Am. 2010 Mar. 92 Suppl 1 Pt 1:107-13. [Medline]. Bedford B, Yang SS. High fusion rates with circular plate fixation for four-corner arthrodesis of the wrist. Clin Orthop Relat Res. 2010 Jan. 468(1):163-8. [Medline]. [Full Text]. Field J, Herbert TJ, Prosser R. Total wrist fusion. A functional assessment. J Hand Surg Br. 1996 Aug. 21(4):429-33. [Medline]. Kistler U, Weiss AP, Simmen BR, Herren DB. Long-term results of silicone wrist arthroplasty in patients with rheumatoid arthritis. J Hand Surg Am. 2005 Nov. 30(6):1282-7. [Medline]. Wagner ER, Srnec JJ, Mehrotra K, Rizzo M. What Are the Risk Factors and Complications Associated With Intraoperative and Postoperative Fractures in Total Wrist Arthroplasty?. Clin Orthop Relat Res. 2017 Nov. 475 (11):2694-2700. [Medline]. Kwon BC, Choi SJ, Shin J, Baek GH. Proximal row carpectomy with capsular interposition arthroplasty for advanced arthritis of the wrist. J Bone Joint Surg Br. 2009 Dec. 91(12):1601-6. [Medline]. Gaspar MP, Pham PP, Pankiw CD, Jacoby SM, Shin EK, Osterman AL, et al. Mid-term outcomes of routine proximal row carpectomy compared with proximal row carpectomy with dorsal capsular interposition arthroplasty for the treatment of late-stage arthropathy of the wrist. Bone Joint J. 2018 Feb. 100-B (2):197-204. [Medline]. Garcia-Elias M. Eclypse: partial ulnar head replacement for the isolated distal radio-ulnar joint arthrosis. Tech Hand Up Extrem Surg. 2007 Mar. 11(1):121-8. [Medline]. van Winterswijk PJ, Bakx PA. Promising clinical results of the universal total wrist prosthesis in rheumatoid arthritis. Open Orthop J. 2010 Feb 17. 4:67-70. [Medline]. [Full Text]. Vance MC, Packer G, Tan D, Crisco JJ, Wolfe SW. Midcarpal hemiarthroplasty for wrist arthritis: rationale and early results. J Wrist Surg. Aug 2012. 1(1):61-68. [Medline]. Osteoarthritis of the wrist, lateral view. Range of motion may be normal in hyperelastic individuals despite underlying wrist arthritis. Synovitis of the wrist with extensor tenosynovitis. Universal incision of the wrist. Extensor retinaculum of the wrist. Exposure of the distal end of the ulna for a Darrach procedure. After resection of the distal ulna. Follow-up of radiolunate fusion (limited arthrodesis) shows good dorsiflexion and palmar flexion. Intramedullary pin fixation for wrist arthrodesis. Total wrist fusion using an AO (Arbeitsgemeinschaft für Osteosynthesefragen, or Association for the Study of Osteosynthesis) plate in osteoarthritis of the wrist. 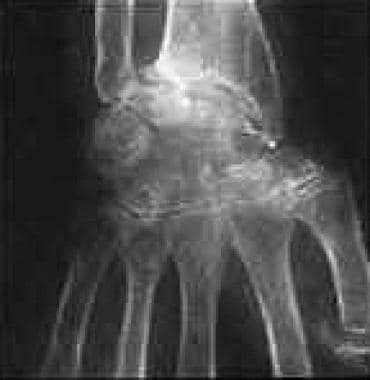 Total wrist fusion using an AO (Arbeitsgemeinschaft für Osteosynthesefragen, or Association for the Study of Osteosynthesis) plate in a person with rheumatoid arthritis of the wrist. Wrist arthroplasty in rheumatoid arthritis of the wrist. Distal radioulnar joint fusion with distal ulnar resection (Sauve-Kapandji procedure).